On the tenth Day of Sugar, my true love gave to me . .
With it being so cold outside, I thought you might need something in the 12 Days of Sugar to warm you up. I have always been a huge fan of hot chocolate. We make it almost every morning in the winter using our Cocomotion (love that thing!). There is just something about a delicious cup of hot chocolate. I remember one year while we were in college, a couple of my girlfriends and I were housesitting for a friend of ours. It was winter and freezing cold outside. I remember one day in particular there was a huge snowstorm and it was bitter cold. We came home from class that day, made ourselves some hot chocolate, turned on some George Winston music and snuggled up in blankets while we sipped our hot chocolate . . . ahhh good memories! Oh how I love, love, love, this hot chocolate. It warms me from head to toe and I could drink mug, after mug, after mug of it. The flavor is just perfect. The first time I had this was a couple years ago at a Christmas Brunch my friend invited me to. She served this hot chocolate and I immediately fell in love with it, I couldn’t get enough of it. It is absolutely delicious and so simple to make. You’ve got to try this! One more thing, if you’re not a fan of almond extract, don’t let that stop you from making this. The almond flavor is so, so subtle that if you didn’t know it was in there, may not even be able to detect it. Remove from heat; add the extracts. Top with whipped cream, if desired. Serve and enjoy. 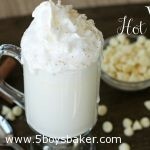 In a saucepan, combine 1/4 cup of the half-n-half, the white chocolate chips, cinnamon stick and nutmeg. Stir over low heat until chips are melted. Discard cinnamon stick. Add remaining half-n- half, stir until heated through. Recipe Source: My friend Diane K.